You receive a load of cantaloups and notice a few of them have sunken spots or sunken areas scattered over the surface. Don’t confuse these sunken areas with bruising, as bruising will show flattened areas, will be soft to the touch, and most likely will show a watersoaked/translucent appearance to the underlying flesh. These sunken areas may be discolored (darker than surrounding skin color) and may or may not affect the underlying flesh. Many times these sunken areas will show light mold growth. What caused these sunken areas? Most likely somewhere along the harvesting/packing chain these lopes were injured, from rubbing or scuffing, resulting in moisture loss of the damaged areas, thus the sunken areas. The moisture loss will progress, so it is recommended to hold the cantaloups in a low temperature (36-41° F), high humidity environment to maintain quality. The USDA has no definitive scoring guideline for us to use, only stating if the sunken areas materially affect the appearance then the cantaloup is a defect. The USDA instructions go on to state that one or two small spots would not materially affect the appearance. Most inspectors will not be too generous with these sunken areas, as consumers will pass these cantaloups over, thinking they may be injured, or showing signs of age, with the dark discolored spots. 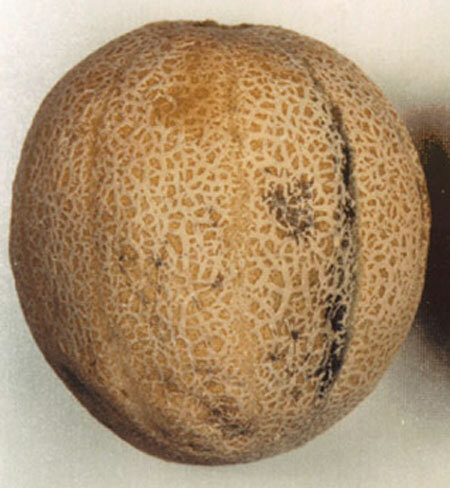 A scoring guideline to follow is: if the cantaloup has more than two sunken areas, or if the area, depth, and discoloration of one or more spots detracts from the appearance, score the cantaloup as a defect. Looking at the cantaloup pictured above, it is without a doubt a defect, and would be reported as damage by sunken discolored areas. Will these spots progress? Yes, the spots usually become larger, increase in size and number and will become darker in color.